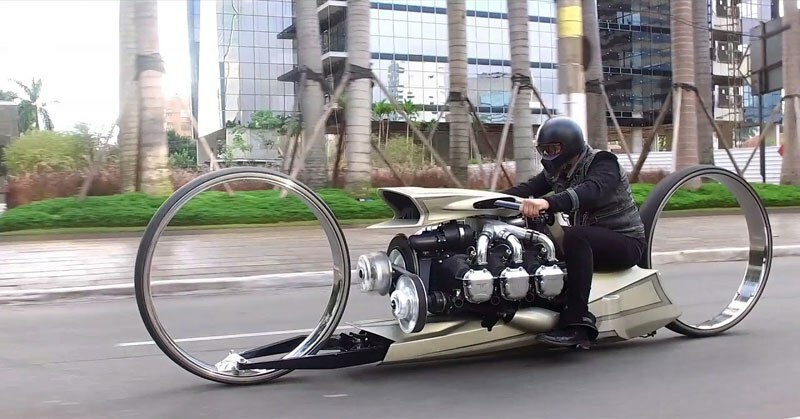 The new TMC Dumont is a hubless motorcycle with an aircraft engine that comes from Rolls Royce. Designed by Tarso Marques, a Brazilian racing driver who has worked for Minardi, the new motorcycle is a piece of art that can be ridden on a regular basis. Powering the TMC Dumont is a huge six-cylinder Rolls Royce engine that comes from an aircraft. The engine is mated to a CVT that has been designed especially for this motorcycle. Hence, there’s no clutch or gear shifter on this motorcycle. You simply hop on and ride this beautiful thing. For the record, the six-cylinder engine outputs 300 horsepower. The motorcycle rides on 36-inch hubless wheels, which are the biggest used on any motorcycle. It looks really futuristic, yet the golden paint job gives it a touch of classiness associated with retro motorcycles. In a nutshell, it looks like a concept from some sci-fi movie. The TMC Dumont has won the ‘Best of Show’ at this year’s Daytona Bike Week. As per Tarso, the TMC Dumont is a tribute to Alberto Santos-Dumont, who is a national hero in Brazil and a pioneer in aviation. He’s one of few people to have contributed significantly to the development of both ‘lighter-than-air’ and ‘heavier-than-air’ aircraft. The TMC Dumont seems to have almost non-existing ground clearance, and the long wheelbase would make it really tough for this motorcycle to turn. Also, the rider sits dangerously close to the rear wheel. Furthermore, the giant wheels block the rider’s view. However, one still can’t deny the great piece of art that the Brazilian racer has created. As far as concepts go, the TMC Dumont is the wackiest yet among the most beautiful piece of art on two wheels. Do you agree?